Use “lightness of being” as a leadership strategy. Learn when humor is appropriate and not. Discover Leadership and Lightness: The Paradox. Use laughter to loosen up the places that may have hardened their hearts. Learn when to let go and when to take action. Increase morale, cooperation, productivity and profitability. Decrease sick time and tension. 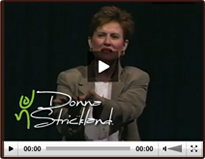 In this presentation, Donna will explore how our state of mind (stress, attitude, and willingness to learn) affects our body, mind and spirit. This fun, informative and exciting presentation will explore both the science of laughter (how laughter strengthens our immune system and reduces stress) and the art of humor (strategies to enhance optimism to help us move from “OH NO!” to “AH HA!”). Good humor creates a sense of joy in being alive. A sense of humor is a developed perspective, an attitude that allows for a sense of control in this change-crazed world. Using a humor perspective can help individuals and organizations stay fluid and flexible in trying and changing times. People who play together, stay together. In fact, people who play together in the work place have increased morale, cooperation, productivity and profitability, and decreased sick time, and tension. Enlightening will strike you again and again in this session as you learn how to: use “lightness of being” as a leadership and life skill, celebrate the temporary, practice humor skills to help cope with chaos, change and crisis, and have the courage to be spontaneous. You will also have the opportunity to participate in a very powerful, healing and meaningful “Circle of Connection” that is utilized by many to help create community. Humor Skills: Activities to bring more playfulness, energy, and laughter to your work life. Seven Stages of the Laughter Progression; Using Aesthetics: Music, Art, Movement for Fun, Finding your sense of perspective. Hands on activities that promote laughter, mirth, and fun. Humor in the Workplace: The message of silliness, Taking jobs seriously while taking yourself lightly, the worth of mirth, how funny business intersects with the bottom line. Shame: The thief that robs us of our spontaneity. Overcoming Fear of Foolishness, Failure, and Embarrassment. It’s relationship to risk-taking and innovation, and how we stop ourselves short from being in the moment. “The Circle of Connection”: A very powerful exercise based on Native American traditions. “Healing can only occur in Community.” An exercise in giving and receiving. Great for natural work groups who are coping with chaos and change. On Being Light: What does it mean for you? What could it look like? What kind of future do you want to create? What’s your part?